"You could look it up." That admonition was a regular heading in an in-house newsletter called Winners & Sinners, which once circulated in The New York Times newsroom. It described itself as a "bulletin of second-guessing," addressing the errors, embarrassments and oddities that even a mighty news organ like the Times let slip into print. In the pre-Internet era, "Look it up" meant consulting the reference books, common and esoteric, that any decent newsroom kept in its library, or on the copy desk. That started with dictionaries, gazetteers, phone directories and atlases. Plus a host of other references that would let reporters, their supervisors, and copy editors be certain they had gotten their facts right. Research tools have changed, of course. The need to double-check the facts in a manuscript hasn't. With the luxury of longer publication cycles than a daily newspaper's insistent deadlines, weekly and monthly magazines employ full-time fact checkers. Not only using standard reference sources to check behind a writer, they often cover the same ground the author did while researching. Magazine fact checkers may contact the people the writer interviewed, and review all points of fact attributed to them in a finished article. I will do the same for your work. With long experience as a news reporter, I'm well qualified to confirm the accuracy of everything in your manuscript that can be checked. That can include talking to any of the sources you interviewed, at your option. Fact checking is an obvious help to a non-fiction writer, but is useful for fiction, too. A novel set in a past era, or an exotic locale, will be full of references to verifiable details, everything from clothing and technology to music and language. You wouldn't want characters in a historical novel set in the 1700s using slang that didn't appear until 200 years later. With the right references (Oxford English Dictionary, for example) a fact checker can quickly OK a phrase, or flag it for the author's attention, with a note about why it's an issue. Spotting -- or suspecting -- anachronisms in fiction requires a reader who's broadly knowledgeable about history, technology, culture and geography. It's often easy to answer a question. It's harder to be aware the question even needs to be asked. That's what I'll do for you: Recognize the questions, ask them, and either get answers or let you know if they can't be answered. Once an error is in print, it's too late to fix. Errors aren't just embarrassing. They can be expensive. Incorrect assertions that damage a person's or institution's reputation can be grounds for lawsuits. Adverse judgments, and even the cost of defending yourself in court, have put publishers out of business and can bankrupt writers. Professional fact checking is a small investment in protecting an author's reputation for accuracy and fairness. 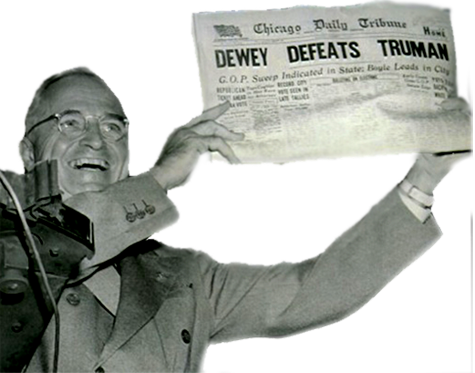 A self-assured politician like Harry Truman knew how to make the most of a whopping error like this one, where the Chicago Tribune prematurely called the 1948 election for Thomas Dewey. This famous blunder stems from the very human tendency to let wishful thinking get ahead of the facts. In 1948, the Chicago Tribune let its editorial-page opinion, which favored Republicans, leak into its news judgment, which should have been based on data. For a more recent example of the same thing, to see video of Karl Rove vs. Megyn Kelly on Fox News the night of the 2012 election. When your book is published, be gleeful like Harry Truman, not chagrined like the Tribune's editors. Let us fact-check your manuscript while there's still time.